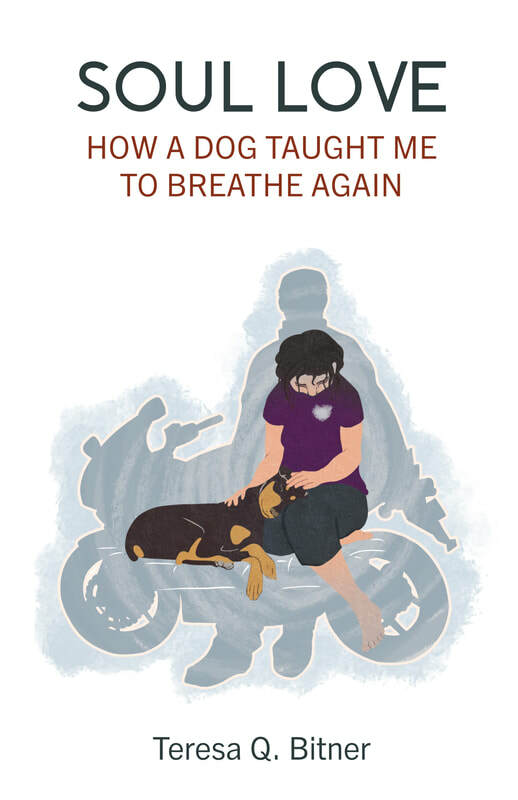 Soul Love: How A Dog Taught Me to Breathe Again is Teresa's first published book and a work of love, labor, and pain. The story kept calling to Teresa to complete it and get it out into the hands of those who need it most. Those who have lost hope, suffered loss, and feel alone. If this is you - lost, suffering from loss this book can be a grief companion. Walk with Teresa and learn how to move from death to life again. If you are a friend or family member - this book can help you better understand the grief journey and ways to support others in their grief. Teresa fought writing this book, denied it but, kept writing a little at a time, she put it away, pulled it out, edited it, put it away, then got serious as it became obvious the story wanted to be told and was ready. The purpose is to reach as many people as possible so no one has to do this alone. This story is about Teresa's journey from crushing grief and utter despair to finding herself, soul and living boldly again. Hans a dog helps tell the more challenging parts that Teresa doesn't want to share with the world. When Kris dies unexpectedly in a motorcycle accident, Teresa and her two high school-aged sons must figure out life as a single mother and fatherless kids. Join them on this visceral journey for an all too human glimpse of grief, hope, and love. They live on a 12.5-acre ranch in Texas, and keep several pet dogs—none as special as Hans, a brown Doberman that they adopt after Kris’s death. Hans’s wise brown eyes, which ‘peer deeply into your soul,’ convince Teresa that he was sent by God to be her personal grief dog. Over the next four years, Hans helps this broken family heal the anger, helplessness, and hopelessness that deep grief causes, teaching them how to forgive, love, and laugh again. Check out the Events Page to find out where Soul Love has toured and where the next one will be. If you'd like Teresa and Soul Love to talk to your group. She'd be delighted - contact her here. Teresa is professional certified coach, speaker, and author specializing in resiliency, change, and loss. Her company Bold Fulfilled Life Coach helps anyone grieving a loss of any kind to claw their way out of the deep, dark abyss. She is passionate about partnering with those who have been knocked down by life and want to build resiliency and move forward to a bold life. Teresa is also a wife and the proud mother of two adult sons and two wily dogs, living in Austin, TX. I can personalize and sign your copy as well. Just let me know in the order area. Thank you for your support! You may purchase a signed or unsigned book locally at Book People or order online.